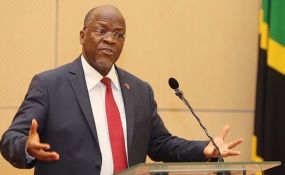 After taking office in 2015, Tanzania's President John Magufuli quickly launched a widely-praised anti-corruption campaign. He made a show of plugging the holes in a very leaky government budget by, for instance, purging "ghost workers" from the public payroll. Three years on, however, not all is well with Tanzania's public finances. Moreover, efforts to ensure effective financial oversight face mounting obstacles. In March 2018, Tanzania's Controller and Auditor General, Mussa Assad, presented his annual audit report for the 2016/2017 financial year. It made for sobering reading. It showed that state entities had diverted trillions of shillings into ghost ventures, while several budget lines were not open to scrutiny. What captured most attention, however, was the unexplained mismatch between the collected revenue of TSh 25.3 trillion ($10.88 billion) and the TSh 23.8 trillion ($10.24 billion) released by the treasury for government expenditure. What happened to the "missing" TSh 1.5 trillion ($640 million)? The government provided a range of explanations for the discrepancy as the controversy spread from parliament to social media. Then, during a function at State House, President Magufuli reportedly interrogated the man behind the report. "The CAG is here," he said, "can you stand up and tell us if any money was stolen." Assad responded: "No sir, no money was stolen!" Despite these interruptions, PAC managed to conduct its review of the CAG report and, early this month, tabled its own report. This document, however, only provided a cursory and largely dismissive review of the CAG's findings. As the PAC chair glibly summarised, "there was no loss nor theft". Catherine Ruge, an accountant and member of the Public Accounts Committee, hit back at the committee's report. She said that there was in fact TSh 2.4 trillion ($1.03 billion) worth of serious audit queries revealed by the CAG. She was compelled by the deputy speaker to withdraw this statement after an objection from a minister. Finally, Halima Mdee MP asked for the CAG report to be made public so all parliamentarians could study it alongside PAC's summary. Her request was denied. Journalists and many others queried this decision, asking why parliament's oversight should be restricted especially when CAG reports were previously made publicly available as a matter of course. More generally, it is internationally recognised - through statements such as the influential Lima Declaration - that such reports should be made public in the interests of scrutiny, discussion and transparency. To begin with, the PAC chair's claim that the report found no evidence of losses or theft is in some sense irrelevant; it misrepresents what the CAG set out to do. The investigation was not a forensic audit aimed at finding evidence of outright theft or at discovering a "smoking gun" and tracing the culprit. As explained in its Terms of Reference, its objective was to simply examine reasons for the 1.5 trillion discrepancy. The CAG report did indeed uncover many anomalies, enough to paint a very disturbing picture. We don't see a bank heist as such, but we do see something like all the cash from a vault strewn in mind-boggling confusion across the floor. A concerning statement at the start of the report, noting the limitations of the audit, sets the tone. It is worth quoting in full: "Our verification was limited by lack of supporting documents and adequate explanations from Management (of the Ministry of Finance), which were necessary for ascertaining the accuracy and validity of amounts to be verified. For example, the Ministry was unable to provide documents such as the proper Cash Book for the Consolidated Funds and Bank Reconciliation Statements that provide crucial underlying information for the figures under verification. The provided information was scattered in numerous sections and were subjected to frequent adjustments in the course of verification" (p2). Moving on, the report finds that the figures for both total revenue and expenditure were higher than previously reported, although it is worth noting, not for exactly the reasons given by the government in April 2018. In contrast to the original numbers, moreover, it suggests that expenditure exceeded revenue by TSh 290.67 billion ($125 million), though cautions that "direct confirmation of balances from the Central Bank did not support the figure" (p 3). The report's analysis then delves deeper into various "weaknesses" of the financial management system. It notes the failure of the Treasury, and its Permanent Secretary (or Paymaster General), to track transactions across several bank accounts. It also sharply criticises the use of excel spreadsheets, which "are susceptible to errors and lack proper data management and backup capabilities" (pp 5-6). In lay terms, they can be edited at will. The report further describes "fragmented accounts and unsupported bank balances", leading it to affirm that, ultimately, "the completeness, existence and accuracy of the Bank Balances cannot be confirmed" (pp 9-10). Skipping ahead to the analysis of actual withdrawals, more mismanagement as well as misallocation comes to light. Among other striking findings is the release of TSh 976.96 billion ($420 million) "without appropriate authority" (p 19-23). Several different ministries were affected; however, in a meeting with the PAC, the CAG reportedly told the committee that the Treasury was unable to provide further evidence of the releases, and the Paymaster General instead claimed money went to State House. It is worth remembering, State House is not audited by the CAG. This story needs additional follow-up and confirmation, but in any event, the TSh 976.96 billion remains a big question mark and, as the report affirms, "Arbitrary reallocations indicate the need for improving distribution of the budgeted funds" (p 30). One last point bears consideration. Although financial management may be so poor as to make effective auditing or the "discharge of the [CAG's] constitutional mandate" (pp 29-30) all but impossible, what of the TSh 1.5 trillion ($640 million)? Where next for Tanzania's public finances? Ruge argues that there now needs to be a proper forensic audit, but this seems unlikely given the political context in Tanzania. The CAG's findings certainly raise questions, particularly around Permanent Secretary to the Treasury Doto James, who is reportedly President Magufuli's nephew. James worked at the Tanzania National Roads Agency when Magufuli was Minister of Works. He joined his uncle's presidential campaign team and, after Magufuli became president in 2015, was named deputy Permanent Secretary to the Treasury. A year later, he was promoted to full Permanent Secretary, replacing his predecessor who, unlike James, had a long career within the Ministry of Finance before rising to the top. In terms of the Tanzania's management of public finances, we can expect to see more of the same for now, or perhaps a further deterioration. The CAG's report exposes the extent to which Tanzania's financial management is in disarray. Unfortunately, and with elections a year away, there is good reason to believe it could become even worse.